Photo courtesy of Sean Linday. Hey, this may not be Engrish at all! and I think its a pretty cool name for a cafÃ©! Sony used it in its Play Station campaign too! Get a 3pc muffin now at land of leather and get half free! You know the chinese saying, twos a crowd but threes company! The Japanese take this whole self-deprecation shtick just a bit too far. is this the same mall with the ok gift shop? 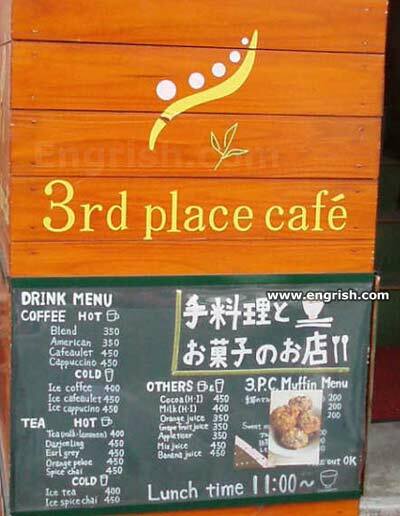 I agree with Node; there’s a coffee shop in my town (in Southern California) called “The Third Place.” Looking at the menu, the only outright error I can see is “cafeaulet” which I suppose is meant to be “cafe’ au lait” … and that’s not English anyway. At least the muffin menu is politically correct.